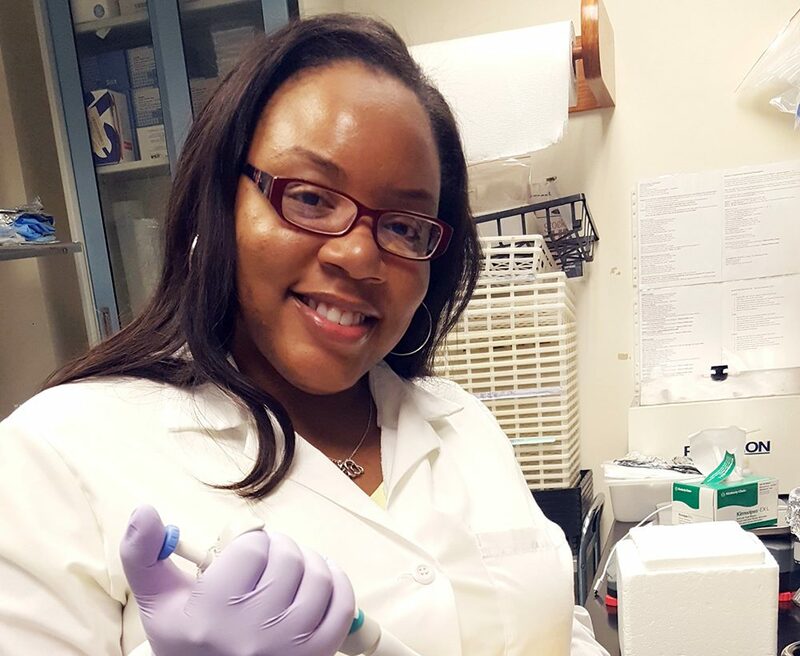 Lillian Oglesby, who graduated with a bachelor’s degree in plant science and minor in biotechnology, works the frontline at the USDA’s Agricultural Research Station located in Fort Pierce, Fla. The HLB disease was first discovered in Florida in 2004. It is a bacterial disease transmitted by the Asian citrus psyllid (a brown aphid-sized insect). The bugs infect trees with a motile bacteria called Candidatus Liberibacter asiaticus. Within 18 months of infection, sick plants show mottled leaves with yellowing veins, premature defoliation, stunted growth. Trees die within five years. The fruit of HLB-affected trees is irregularly shaped, remains green at the bottom and tastes bitter. Currently, there is no cure. By 2009, the disease reached epidemic proportions, spreading through Florida’s citrus producing counties. A study conducted by the Food and Resource Economics Department at the University of Florida estimates that the disease will cost farmers more than $331 million annually (or $1.66 billion spanning five years, representing 19 percent of the state’s average grower revenue). At the USDA, Oglesby extracts metabolites from citrus plants to determine signs of HLB. She has been researching the disease for the past eight months. The Fort Valley, Ga. native has long ties to FVSU’s campus. After graduating from Peach County High School, Oglesby wanted a change of scenery. She enrolled at Stillman College in Tuscaloosa, Ala., where she majored in biology. When Oglesby returned to middle Georgia the summer of 2007, she decided to take a few courses at Fort Valley State. That is when she met Dr. Sarwan Dhir, director of FVSU’s Center of Biotechnology, who opened her eyes to the opportunities available for students within his program. Oglesby describes the biotechnology program as close-knit, where professors provide one-on-one mentoring for students. As an FVSU student, Oglesby worked as a lab technician, where she supervised and mentored summer interns. She conducted plant tissue cultures for research projects on the Valerian herb (a perennial flower plant that can act as an effective sleep agent), the Stevia plant (an herb used as a zero-calorie sweetener), and tobacco. Besides on-campus research, Oglesby had several summer research opportunities. In 2008, she interned at Michigan State University, where she sequenced potato chromosomes. The following year, she interned at Monsanto Corporation, operating its vector quality control lab and analyzing DNA sequences. In 2012, Oglesby enrolled at Florida A&M University, where she worked as a graduate research assistant at the Center for Viticulture and Small Fruit Research. She cloned genes from Muscadine grapes, and designed experimental procedures to analyze the gene expression of the Vitis species. Oglesby earned her master’s degree in plant science/molecular biology in 2014. In 2014, she was hired as a research assistant on FVSU’s campus, teaching and preparing courses for the plant science undergraduates. In August 2015, she was hired by USDA’s Natural Resource Conservation Service as a soil conservationalist, where she worked with farmers. For more details about the College of Agriculture, Family Sciences and Technology’s plant science undergraduate and graduate programs, visit http://goo.gl/9l40Pd or contact Dr. Sarwan Dhir, (478) 825-6887, dhirs0@fvsu.edu.